Before I start this piece on valuation, I just want to say that nothing in business or finance is as complicated as it looks, and nearly all of it is much simpler than you think. I’m going to get a bit wonky in explaining some terms here but what’s important is that the concepts are understood. Equations don’t mean much of anything without an understanding of their importance and relevance. The intrinsic value of a company is the present value of all of its future free cash flows. Quite a simple statement, but it’s of course not always easy to estimate those cash flows given that they accrue to the firm in the future. Note that word all in the original sentence. That means from now until the end of time- all the free cash flows that it will ever generate. NOPAT is the operating profit of the firm (earnings before interest and taxes) less its income taxes. NOPAT is therefore a measure of earnings excluding the effects of debt on the firm’s net income. By excluding debt it focuses on the value of the firm’s operations and shows how much cash is generated which can be used to either pay debtholders, pay owners, or reinvest in the firm. So, free cash flow is the amount of cash that the firm generated from its operations minus the amount of cash that it reinvested into its operations. These cash flows are “free” because they can be used freely to pay off debt, buy back shares, pay dividends, or just leave in the firm’s bank account. If you are an owner of a private company, this is what you would think of as “real earnings” that you can pay yourself with, given that you don’t have to reinvest those funds back into the operation. This of course differs from GAAP accounting earnings that are displayed on an income statement, as you must likely reinvest some of that back into the business to maintain sales and grow. So to properly value a company, one must predict all the free cash flows the firm will ever generate, discount them back to the present (since cash earned in the future is worth less than cash in hand now), and then sum it all up. This would be called the intrinsic value of the firm. 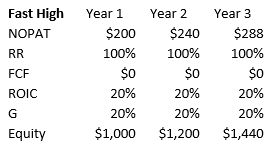 FCF in this equation is the free cash flow your firm will generate in the first year. W is the required return- aka the return that you require on this investment. Academics use WACC, but since us investors don’t care about the CAPM, beta, or volatility, you will simply use whatever rate of return you need from an investment. You will have to use this same W when valuing all potential investments so you have a level playing field on which to compare stock valuations, otherwise you could simply call a firm undervalued because you decreased the W from 10% to 1%. Also note that this would be the intrinsic value based on the returns you require- those who only need a 5% annual return should be willing to pay more for their investments than somebody who needs a 15% annual return. G is the annual growth rate of the firm’s free cash flows, and in this equation we assume it remains constant forever. Both W and G are expressed as decimals, with 1 being equal to 100%. So this firm is worth $100. It is useful to know that if a firm will never grow, you can multiply its average annual free cash flows by 10 to get a pretty decent measure of its intrinsic value. If you ramp up growth, it is of course worth more. Let’s try 5% annual growth forever using the same FCF and RR. The value of the firm doubled. Again, remember this would be 5% annual growth not just for the next 10 years, or the next 50 years, but forever. This is why using such a simple formula is almost never practical. In a previous post, I noted that a firm grows based on its return on invested capital (ROIC) and its reinvestment rate (RR). Simply, ROIC is the amount of NOPAT that the firm generates compared to its invested capital. It is a good measure of how much profit it generates for each dollar invested into the firm’s operations by both equity and debt-holders. The reinvestment rate is the percentage of this NOPAT that the firm reinvests back into the firm’s operations. We will assume a constant ROIC and so we can ignore this equation for now. This is saying that if the ROIC of the firm is 25% and the growth of the firm is also 25%, it must be the case that the firm is reinvesting all of its earnings back into the firm. If the ROIC is 20% and growth is 10%, then it must be reinvesting only half of its earnings back into the firm. Instead of finding the net investment by subtracting year 2’s invested capital by year 1’s invested capital, we can just multiply the firm’s operating earnings after taxes by the rate at which the firm reinvested them into its operations. We then swap out Net Investment with NOPAT x RR in the first of the three formulas, and can pull that second NOPAT out from under its parentheses in the third equation. This final equation is usually called the key driver value formula, or the Zen of finance. It shows intrinsic value at its most basic roots in terms of G and ROIC (displayed in that theoretical constant growth perpetuity equation). We can see the relationship between G, ROIC, and RR, and how they affect a firm’s cash flows and total value of the firm. The higher the ROIC, the higher the firm’s organic annual growth rate can be. The more the firm reinvests in its operations, the higher the growth rate, but the lower the FCF. The higher the growth rate, the higher the continuing value of the firm’s operations. The lower the amount the firm has to reinvest in order to grow, the higher the FCF. The value of a company depends on both its returns on capital and growth. This is why the “value versus growth” debate is so meaningless. Growth influences value- they are one in the same. This is also why earnings multiples can be misleading at times. Some companies with high P/E’s may be cheap, and some with low P/E’s may be expensive. It all depends on future free cash flows. In practice you wouldn’t use a formula like this to value a company, but it is useful to go through that derivation to show the relationships between the variables relevant to a firm’s intrinsic value. To actually value a company you would have to think about future cash flows and how they will grow over time. Using a formula like this is in my opinion, of little practical use. In reality you would have to estimate each year’s cash flows over a certain period of time when the firm is growing at an above-average pace and then thereafter assume a constant growth rate. You may have noticed that if the reinvestment rate is 100%, the value of the firm according to this equation is 0. This is because it assumes constant growth of an initial positive FCF, and if that FCF is 0, then the firm cannot be valued in the formula- so it is only relevant to mature firms. So how do we go about valuing a company if it is reinvesting all its earnings back into the business to grow and therefore generates no free cash flows? I’ll show a simple example of a lemonade stand and why this can be initially confusing. Let’s assume we started a lemonade stand with $5,000. The business generates a 20% ROIC every year on total invested capital and it reinvests all earnings back into inventory and upgrading the lemonade stand. We assume the business has no debt. At the end of 5 years, this business has grown earnings at 20% annually, has a book value of equity of $10,368, and has generated $7,442 of total earnings, but hasn’t generated any free cash flows. Obviously, the firm is worth a significant amount, but we cannot value it on FCF yet because it is growing and reinvesting at a high rate. This equation does not include changes in working capital because it assumes the firm can maintain sales at its current working capital levels. So if we assume that for our lemonade stand there are no other non-cash charges besides D&A to deal with, and that D&A are a good representation of the amount we need to keep our lemonade stand in working order, then owner earnings would be equal to our NOPAT figures. Generally speaking, operating earnings are a decent benchmark for a firm’s owner earnings. ROIC and Growth are the two main determinants of the value of a firm’s operations, and clearly the best firms deliver extraordinary returns on capital and grow quickly due to their potential expansion opportunities. Most mature firms have stable ROICs but lower growth. Mediocre companies usually grow slowly and have lower ROICs. The WORST possible outcome however, is to have a low ROIC business growing rapidly- I will show why that is the case. Below you can see four different scenarios of company based on ROIC and Growth. Slow/Fast represents the speed of growth, and Low/High represents the ROIC. First up is the slow growing, high ROIC firm. It’s likely a very mature firm and is paying out 80% of operating earnings as dividends. Earnings growth is very slow, but the firm doesn’t have to reinvest much to get that earnings growth. Earnings are reinvested at high rates of return, so this would be similar to a high dividend yielding oligopolist with limited growth opportunities. Next is the fast growing, high ROIC firm. Growing at 20% a year, and reinvesting all earnings back into the business. This one has the most potential to increase intrinsic value at high rates going forward. Paying fair value for such a firm would allow the owner to achieve excellent returns over time. The slow growing, low ROIC firm has poor returns on capital, but is only investing a modest amount of its earnings annually to get that tiny growth while paying out the rest. This firm doesn’t have much potential, but if purchased at a very low price it could be a good investment. With equity so much higher than earnings, it is possible that even at a reasonable multiple of earnings the stock would be undervalued based on the value of its net assets- for example, at a P/E of 8 you would be paying $256, or 24% of its Year 3 book value. Of course, we would have to ensure that book value is representative of underlying asset values since paying a low price is paramount to such a business delivering high returns as an investment. Since the value of this firm’s operations is quite low relative to asset values, the equity value comes into play and we may be able to purchase those assets at a massive discount (along with the low earnings the firm generates). It isn’t the prettiest way to invest, but it has been done by many successful investors and can be highly rewarding. Additionally, if the equity value is highly liquid- say it’s nearly all cash for example, we could purchase the firm for $800 at a high P/E of 25 and still do quite well. In that case, the value of operations would be more of an additional benefit than anything. For good businesses such as the high ROIC ones above however, equity value is largely irrelevant as nearly all of the firm’s value comes from its operations. If a firm’s assets are worth more than the value of its operations, long-time owners have been harmed. As an example, for a restaurant it clearly isn’t good for the long-term owners if the building they once purchased is worth more than the value of the business as a going-concern. If the stock is cheap enough however, bargain hunters can benefit from this situation. This last one is the fast growing, low ROIC firm. This one is an absolute disaster and basically requires poor management to enable its growth. If you noticed, equity and earnings are growing at 20% annually with an ROIC of only 3%, how could that be? It is because the owners are increasing their invested capital in the firm- essentially paying out of their own pockets to buy assets in order to increase growth. Privately held small businesses do this all the time, and some large public companies do it as well by issuing shares to unwitting investors. This firm is a capital-waster and is sucking in more and more cash to deploy it at low returns. The main problem with this business is that every year it is deploying more money at 3% returns, while that could have been deployed at average returns somewhere else. This means that every year, investors are losing money as the firm reinvests to grow. Equity investors might not know it, and they can’t feel this loss, but if they were to calculate their future earnings if they invested that money in something delivering say 10% a year versus this 3%, they would realize how much money they are throwing away. To summarize, the intrinsic value of a firm’s operations are a result of its growth and returns on capital. To achieve decent returns, you can pay fair amounts for companies with high growth and ROIC, or very low amounts for firms with low growth and ROIC. If the firm is deploying high amounts of capital at a low ROIC, management is enabling poor business results and will be more interested in the ‘institutional imperative’ of keeping the business alive and growing rather than being focused on the interests of owners. There is no growth versus value debate, there is only value and it depends on growth and ROIC. If you are capable of properly valuing companies that you can understand, it is certainly possible to do extremely well in public equity markets given the irrational and frequent changes in stock prices. The key is to accurately value companies and purchase them when cheap relative to that value. “If the value of a company doesn’t scream out at you, it’s too close”. If you understand the basics of valuation and invest in what you know, playing with numbers on a spreadsheet isn’t going to be of much use. You will know rather quickly whether it is relatively cheap or not based on the reasonable range of potential fair values- if it is far below this range, buy as much as you can. If you have to squint at an excel sheet and engineer your assumptions to determine whether it’s a good buy or not, then either you do not understand the business well enough or the margin of safety is far too small.